Every patio needs a dining area! Create your own special dining area using our Patio Fan Back Poly Dining Chairs with Arms. These chairs look exceptional around almost any poly table, but these chairs look rather extravagant when placed around our Rectangle Patio Poly Table. 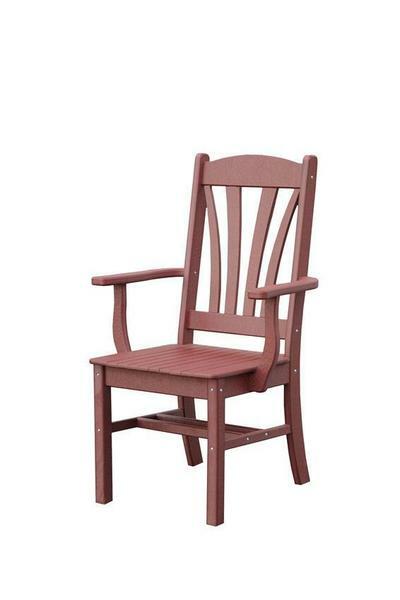 This Poly Patio Fan Back Arm Dining Chair is the perfect way to add some color and style to your outdoor dining furniture. Customize this poly chair to ensure it matches with the rest of your outdoor decor by choosing your preferred color from our wide range of selections. Please call one of our Amish furniture specialists today with questions or ordering assistance on our popular Amish furniture. If you have any questions about any of our products or wish to place an order over the phone, do not hesitate to call and speak with one of our friendly Amish Furniture Specialists toll-free at: 1 (866) 272-6773.